First, it is absolutely essential to double-check whether what you want to report is really a bug. If it is not and you report it, you are wasting developers’ and testers’ time since they have to deal with an irrelevant report. All bugs are to be reported on the Bug report page. 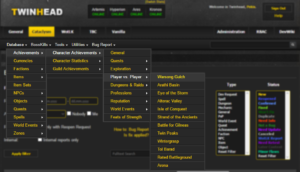 Notice: The first step is to select the right EXPANSION (Vanilla, TBC, WotLK, Cataclysm; for this purpose, Vanilla will be considered an “expansion” as well). Every report has to have a correct form and contain some fundamental information so that a dev/tester can look into it. Reports that do not meet these requirements have almost zero chance to be taken into account. A good report should be transparent and well-formatted. Additional information and links to related NPCs, objects, spells etc. Source of information – links to official discussions, guides, logs etc. If the information provided is not sufficient, a dev/tester might ask for more information to be able to resolve the issue. Therefore, you need to watch the report even after creating it and add any additional information in case you are requested to do so. If such a situation occurs, you will be informed via an e-mail and the report will be marked as “Need info”. There are two way of creating reports. If there is a specific database entry for what you want to report, “Specific reports” are used. Otherwise, you can create a “Global report”. 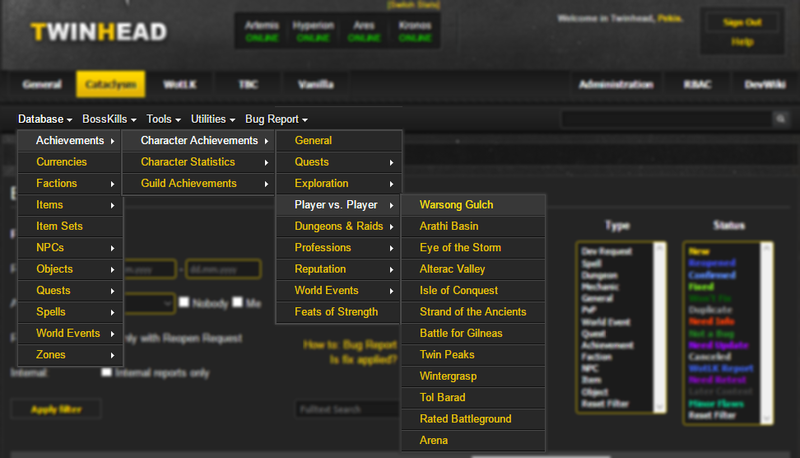 Notice: WotLK only – if you want to create a report, you have to be an authorized user. Since all of the above have their own database entry with a specific ID, any bug related to them is to be reported under the respective entry. It is necessary to find the entry (spell, achievement, item etc.) in our TwinHEAD database. Mostly, it can be easily done via individual database categories. They will appear after moving the pointer to the “Database” tab. It is also possible to use the search field. Notice: Before reporting a bug, you have to check whether the bug has or has not been already reported. That is what you can find in the “Issues” tab. The image below shows that there already is a report for Vile Poison and there even is a duplicate report. If there is a report for the entry (no matter what problem it describes), do not create a new one but always submit a comment to the existing one! This rule does not apply if the existing report is marked as “Cancelled”, “Duplicate” or “Won’t Fix”. When submitting a comment to a closed report marked as “Fixed”, use the “Request Reopen” button in order to let us know that a new problem has been found. Thus, in the example above, you would have to add a comment to report 9844. 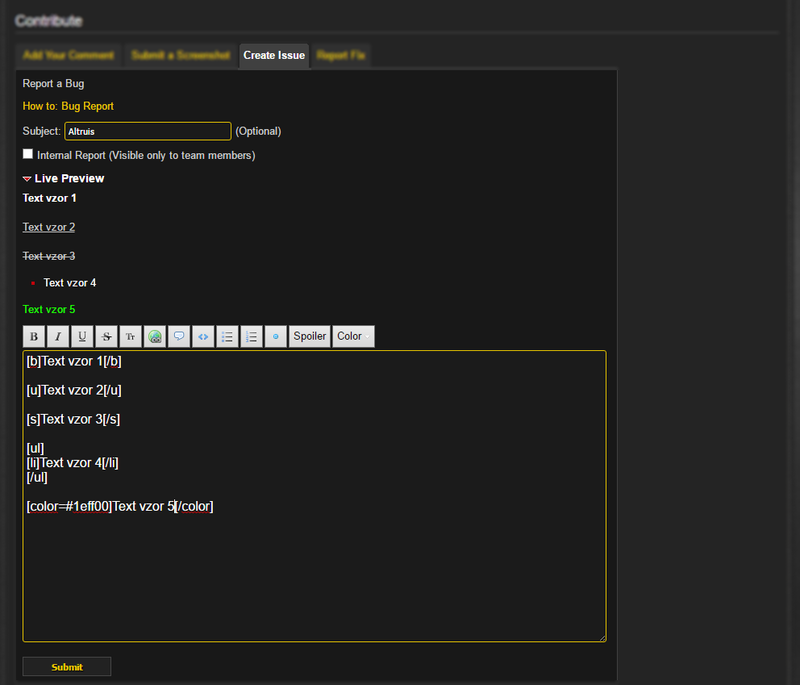 Now we can move to the lower part of the page, where you can report a bug for the entry. 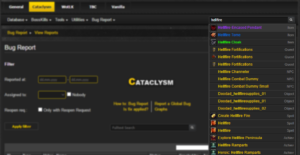 Select the “Create Issue” tab and describe the bug you are reporting. When you finish, click on “Submit” for sending the report in. You can use various text formatting options in order to make the report more transparent. If a bug is reported this way, it will be correctly linked to its respective database entry. Internal reports: An internal report is created the same as a normal report, plus you have to tick the “Internal Report” field. That means that only the report’s creator, devs and testers will be able to see it. An internal report is to be created when it describes a bug that is/could be abused and sending in such a report publically would increase the probability of such abuse. 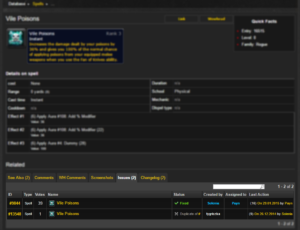 Reporting quests: All NPCs, items or objects directly related to a quest are to be reported under the quest itself! For example, if there is a missing NPC that has to be slain in order to complete a quest, you need to report it under the respective quest. Reporting glyphs: If you want to report a bug concerning a glyph, report it as a bugged spell, not a bugged item. You therefore have to find the spell belonging to that glyph. The easiest way to do so is to find the glyph (item) and then click on the green text in the description of the glyph that tells you about the glyph’s effect(s). You will be redirected to the page of the spell under which the glyph is classified. Reporting set bonuses: Set bonuses are also to be reported as bugged spells. 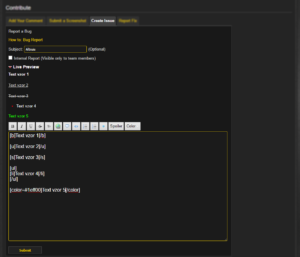 The respective spell can be found on the set’s page under the “Set Bonuses” paragraph in the description. Notice: Regarding the 4.0.6 instances (Blackwing Descent, The Bastion of Twilight and The Throne of the Four Winds), there is one report for each instance summarizing all bugs – bosses, trash, general issues etc. This system is used no longer, but the reports for these raids remain as they are now. Thus, the only valid procedure of reporting bugs in newer raids is described in the “Reporting raid bosses” paragraph. Here you only need one click to get to the form for reporting: go to the main TwinHEAD page of “your” expansion, move the cursor to the “Bug Report” tab and click on “Report a Global Bug”. This option is also accessible from the page containing the list of all issues. Now you are supposed to describe the bug (see the instructions mentioned earlier) and select one from the four types above. Every report is “New” when created. Then its status changes according to how the report is dealt with. New: Report has been created but not checked yet. Need Info: More information is needed for the report to be resolved. Confirmed: Report has been checked; there is enough information for it to be fixed. Reopened: Report was fixed in the past but the bug has appeared again or a new bug has been found. Fixed: Reported bug has been fixed and applied to the live server. Minor Flaws: Reported bug has been fixed except for some minor details. Need Retest: It needs to be re-tested whether the reported bug is persisting on the live server. Need Update: Reported bug has been fixed and is ready to be applied to the live server. Later Content: Report is not relevant in terms of current server content. It will be dealt with later. Not a Bug: What is described in the report is not a bug. 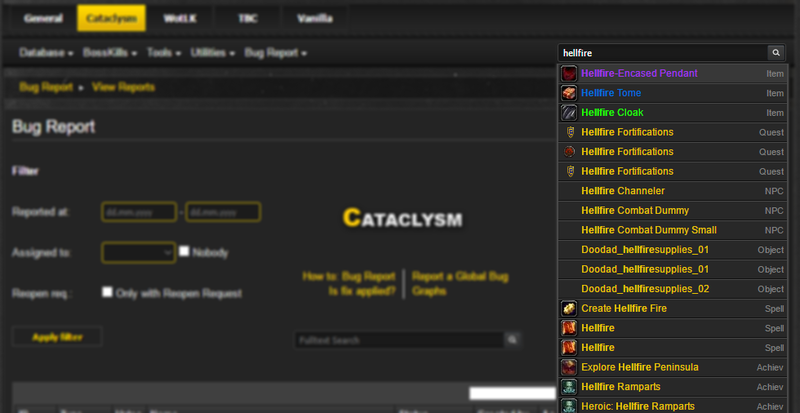 WotLK Report: Only for the Cataclysm realm. 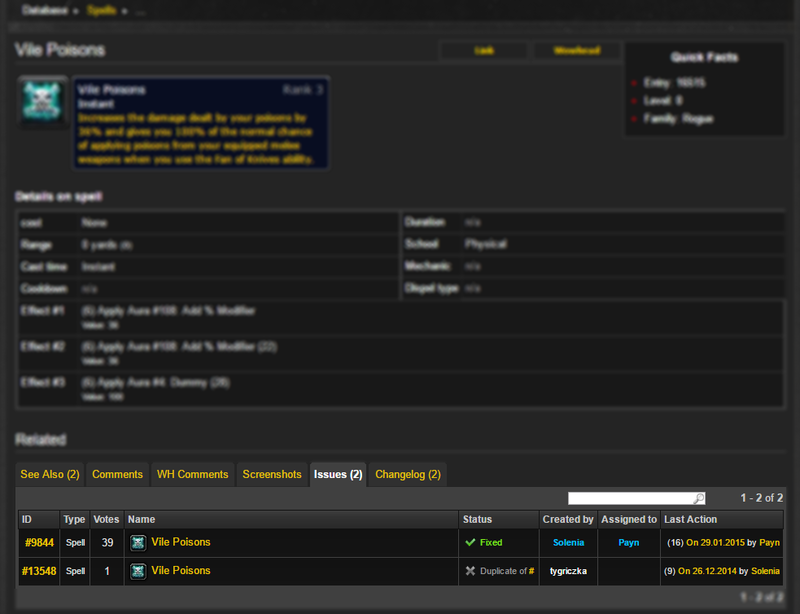 The reported bug was tackled on WotLK in the past so there might be a fix to use from that time. The report is “Confirmed” as well. Won’t Fix: Reported bug will not get fixed for now. It is because the bug either cannot be fixed or it is pointless to fix it. Duplicate: Report is a duplicate. Canceled: Report has been cancelled. If you find a bug concerning any of the above, report it to the General section of TwinHEAD. The tab for this section is next to the tabs for individual expansions. The process is the same as for reporting a general bug. Notice: Here you can also post your SUGGESTIONS for any of the above. So if you have any idea, comment or anything, feel free to submit an issue. Accepted: Confirmed/accepted report; there is enough information for it to be fixed (or for a new feature to be implemented, for example). It is similar to “Confirmed”. Resolved: Report is resolved (the bug is fixed, feature implemented etc.) and the result applied to the server. In Progress: Report (bug, feature etc.) is being worked at.